She wore a raspberry beret, and when it was warm she wouldn't wear much more. How we perceive colors can be tricky. The other day my daughter picked up a crayon and said "Here, that's pink dad!" Two year olds are excited about most things. I tried telling her it's magenta, she's not concerned. It's pink, she's certain. With colors there's just so much range. Is something pink, magenta or raspberry? What if she wore a magenta beret? It would sound fairly dull, perhaps better than pink, but only just better. Is red wine really red? It's not, it's somewhere between burgundy and purple, and what's burgundy other than the color of wines that come from, Burgundy? I don't think it's much more specific than that. But I'm no expert, I only play one on the internet. If any wine will get us scratching our heads it's rosé. Named for the color pink in french but really there are rosés all over the color spectrum. From orange to damn near red. This week's Friday Find is a rosé that I think would make Prince, or whatever he's calling himself these days proud. 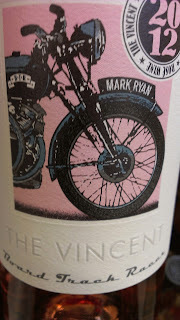 The Vincent Rosé from Mark Ryan's Board Track Racer more affordable motorcycle themed label is may not be a direct homage to Prince, but for my purposes it certainly works. 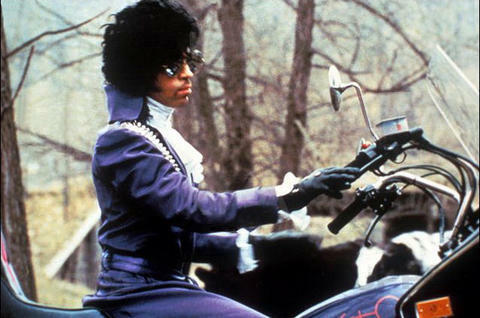 After all he put her on the back of his bike, and they went for a ride, down to old man Johnson's farm. While overcast days don't really turn us on either, this rosé is prepared for that, but it would prefer those awesome summer days we've been having, until yesterday at least. While across the board, or the board track as the case may be 2012 rosés lack the acids of 2011 this one still comes correct with lots of citrus aromas, as well as a hint of cut rhubarb. The acid is there and the flavors are bright early season strawberry and wet stone. The Vincent can be found at many well stocked Washington wine stores and Whole Foods.